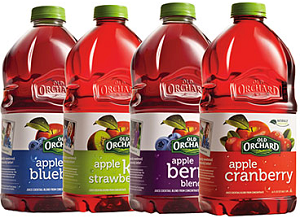 Enter for a chance to win the FREE Old Orchard Holiday Juice Sweepstakes Giveaway! Ends December 1, 2014. •One lucky winner will receive 52 VIP coupons, each redeemable for one 64-ounce bottle of Old Orchard juice, up to a $3.49 value. •25 finalists will win three bottles, one each, of the limited edition fall-flavored fruit juice drinks: Apple Pie, Caramel Apple and Apple Cherry Cobbler. •Entries must be received by 11:55 p.m. ET on Monday, December 1, 2014. Limit one entry per person.